Paint Your Wagon (1969). Adapted from the 1951 stage musical by Lerner and Loewe. 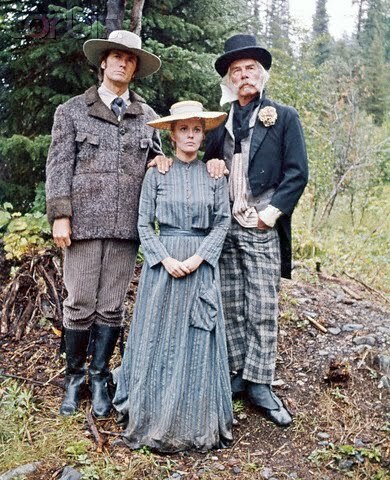 Cast: Lee Marvin, Clint Eastwood, and Jean Seberg. This one of those movies I'm embarrassed to admit I love. I really enjoy the friendship that develops between the two lead characters and their lack of singing talents, which is so bad that it becomes interesting. The story begins as a wagon crashes into a ravine. Prospector Ben Rumson finds two brothers, one is dead and the other is injured with a broken arm and leg. As the one brother is about to be buried, gold is found at the graveside. As dirt is flying, Ben stakes a claim on the land and declares the other brother as his "Pardner". Later, Pardner, a hopeless romantic sings a love song about a girl named Elisa (can you believe Clint Eastwood is really singing)? Pardner hopes to find enough gold to buy some farmland. Ben claims that while he is willing to fight, steal, and cheat at cards, he promises not to betray a partner, and that he will share what ever gold he finds with Pardner on the condition that Pardner takes care of him in his moments of melancholy. Soon, a tent city by the name of "No Name City" is built with the miners living a wild life and singing songs ("Hand Me Down That Can o' Beans") sung by the Nitty Gritty Dirt Band. My favorite song in the movie a beautiful balled called "They Call the Wind Maria.". By this time, the men are missing female companionship and the arrival of a Mormon, Jacob Woodling, with two wives, is the last straw. They talk him into selling one of his wives to the highest bidder. Elizabeth agrees to be sold, believing that whatever she gets, "it can't be as bad as what she has." A drunken Ben has the highest bid. Ben is readied for the wedding by the other miners ("Whoop-Ti-Yay")and Elizabeth is married to Ben under "mining law". She wants him to treat her with respect and to build her a wooden cabin. Ben promises to build her a cabin and with the help of the town's men, Elizabeth has a roof over her head.. Elizabeth's presence soon becomes a problem for Ben. Just in time to save to Ben's sanity, they hear the news of the arrival of "six French tarts" coming to a neighboring town and quickly come up with a plan to kidnap the women and bring them to "No Name City" ("There's a Coach Comin' In"), providing the town with income as other miners from all over will travel to "No Name City" for... what should I call it... the night life.. Ben leaves Elizabeth in the care of Pardner. While Ben is gone, the two fall in love ("I Talk to the Trees"). Elizabeth says that she also still loves Ben, and convinces them that if a Mormon man can have two wives, a woman can have two husbands. Everything seems to be going, what I will call.. reasonably well.. until a group of religious settlers is rescued from the snow. They are invited to spend the winter with Elizabeth and Pardner, who they believe to be her only husband. Ben has to stay in town. What will happen to this love triangle ? This is a clip from behind the scenes of Paint Your Wagon. Eastwood and Marvin did their own singing while Seberg's songs were dubbed. The Nitty Gritty Dirt Band has a cameo in the song "Hand Me Down That Can o' Beans". This film was made near Baker City, Oregon, Big Bear Lake, California and San Bernardino National Forest. Eastwood said that the experience made him want to become a director. According to Robert Osborne, "Marvin drank heavily during the filming of the movie, which may have enhanced his screen appearance, but led to delays and many retakes." My gosh..can you imagine.. Dawn, the "Dirt Band "has a whole part on their album (CD) Alive where they talk about making the film. They did not feel very welcome in Baker. Jeff Hanna's line is" Baker Oregon, Where they don't like long hair........ Even on their wives". Dawn, this is one of many off-beat and strange films that were made in the 1960s. Like you, I am ashamed to say that I like this film. The story draws you in and is quite funny at times. It is perhaps one of the strangest musicals ever made--along with Rocky Horror Picture Show and Little Shop of Horrors. My dad is a huge Clint Eastwood fan, but he'd never seen this so I decided we should watch it. At the end he said he'd never think of Clint in the same way. LOL! Dawn, I don't think I have seen "Paint Your Wagon" all the way through. I remembered that they used the folk ballad "They Call the Wind Mariah" as I, too, like that song. The plot sounds quite unconventional and I do like Eastwood and Marvin. I may have to check this out again because I found both your and Kim's comments about being embarrassed to like this film intriguing. You have penned a fascinating review and I really enjoyed reading it! Dawn, like Toto, I only seen parts of PAINT YOUR WAGON. But your intriguing review makes me want to watch it all next time it's on TCM! Paul, Love the fun facts. I have not heard the Alive CD, where "Dirt Band " talk about making the film. Rick, Thank you. I think this is one of Lee Marvin's, best films. Terrific review, Dawn! I haven't seen this film, either, but I will definitely be checking it out (it's at Netflix, my go-to place). You shouldn't feel emabarrassed to like a film, regardless of its peculiarities or lack of popularity, etc. Some films just catch us at the right moments, so who cares what others may think? Dawn, you've written numerous enjoyable write-ups, but this one is undoubtedly one of your very best! Thank you, Sark. I hope you enjoy watching, Paint Your Wagon, as much as I did. Dawn, I think Clint sang again as a country crooner in HONKY TONK MAN. Rick, I think you are right.. I forgot all about, HONKY TONK MAN. One of your best, Dawn. I like it too, and also felt kind of weird about it, but I agree wholeheartedly with Sark. Our gut feelings take us to some very interesting places with film, and I like some that are considered less than quality. I don't care. We are the appreciators, and without us there would be no film or music or anything else. We can like what we want! God bless the movie lover!